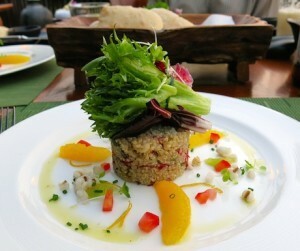 If you are a vegan who enjoys luxury and fine dining, you would have more reasons to travel to the Land of Smiles, Thailand. If you think that eating plants doesn’t go along with being a gourmet, then start your adventure at the following places and experience an awesome gourmet vegan dining. Right in the heart of Thailand’s lively capital city, Bangkok, you will find Bo.lan where you can satisfy yourself with Thai food. This restaurant is welcome for both vegan and non-vegan, you better stop worrying bring with you someone who loves meat. Dishes are garnished with local herbs and vegetables along with perfect Thai flavors. Both vegan and the non-vegan menu will surely be enjoyed plus the stunning presentation that makes every plate delicious and artistic. Going north to Thailand’s second largest city, Chiang Mai and prepare for the next adventure to the Four Seasons Resort Chiang Mai cooking school and see what they can offer. Aside from a vegan gourmet experience, going there is also an opportunity to learn everything about Thai cooking by visiting Thanin Market load with 100% clean and healthy vegan food. Experience the luxury gourmet at the Four Seasons Resort through their superb vegan food in a magnificent and luxurious setting at the resort’s restaurant, Terraces. In addition to mouth-watery and sumptuous vegan food, appetizers, and dessert, you will also like the awesome scenery in the place. Imagine eating a healthy mixture of East and West flavors with local ingredients right on your plate. You might try little arancini that are flavored with hot Chiang Mai pepper and Thai basil. Have a stay in Shangri-La Chiang Mai and get a classy vegan gourmet experience while enjoying the entire sights in Chiang Mai. You can start your day with a breakfast loaded with delicious vegan food including, fruit salads, fresh noodle soups museli and the so-called Pad Thai, a noodle dish similar to Thailand.